It gets even better. Only the cream of the crop even took the exam. There were 25,768 students in the Phila. public school 11th and 12th grades. Only 5,172 students even took the exam, or 20%. Based on their scores, they probably wouldn’t know how I arrived at 20%. To paraphrase George Carlin, when you see how stupid the 20% SAT takers are, just imagine how stupid the 80% who didn’t take the exam must be. The SAT score predicts your possibility of achieving a passing grade in college. Based on the scores of the Phila. students, less than 10% of high school seniors are capable of succeeding in college. To prove how warped our higher educational system has become, there were 8,439 graduates and 54% of them enrolled in college. If you were wondering where the hundreds of billions in taxpayer funded student loans are going – here’s your answer. 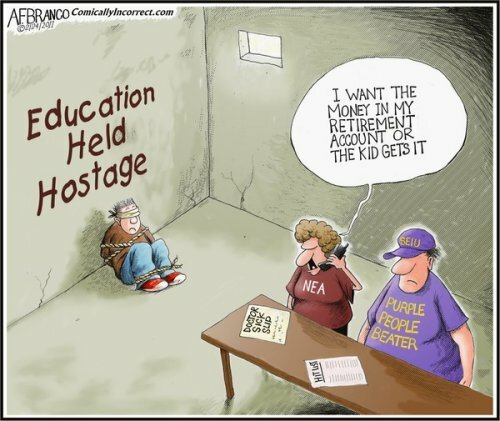 It’s getting doled out to functional illiterates with zero chance of succeeding in college. There’s a 100% chance you will end up paying for the billions in student loan defaults. Despite a $2.8 billion annual budget, with over $1 billion coming from the State and Feds, the Phila. public school system is a complete and utter disaster. It is so bad the State had to seize control a few years ago by forming a commission to manage it. The buildings are dilapidated, rat infested, filled with mold, and need to be patrolled by police. Teachers are assaulted, principles fake test scores, students brawl, the learning materials are pitiful and little or no learning occurs. It begs to question, where did all the money go? Considering there are only 8,400 teachers and 300 principals, one wonders what the other 9,000 district employees actually do. There are 199,000 public school students, but only 134,000 are in the Phila. district schools. The other 65,000 are in charter schools. The 16 to 1 student to teacher ratio equals the national average. There were 212,000 students in 2003 with less teachers. More government employees were hired even though student enrollment declined 6%. The teacher’s union doesn’t care about the children. They care about getting their teachers as much as possible, and they’ve done a phenomenal job getting below average teachers gold plated benefits and pensions. The government unions use their voting power over the Democrat politicians to shakedown the taxpayers. 8 Years of Obama “Change We Can Believe In” ; but won’t survive!